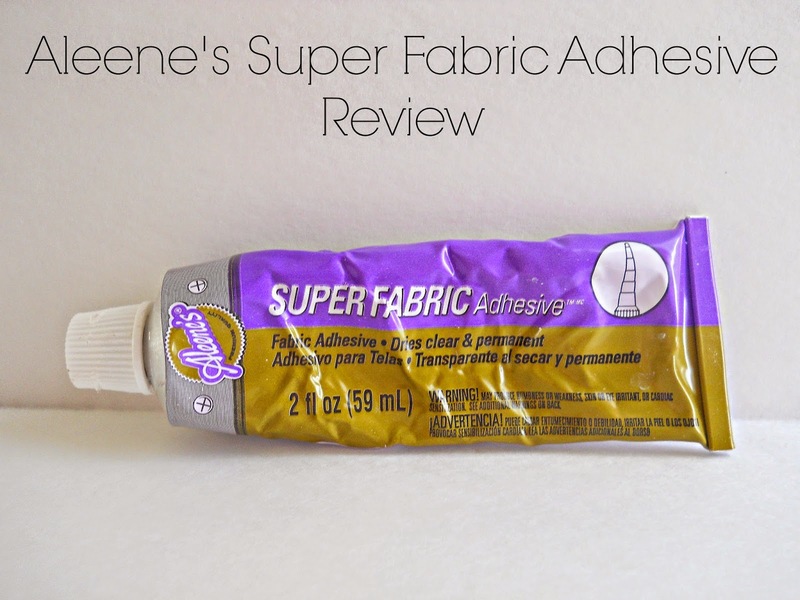 Today I wanted to give you a reivew on Aleene's Super Fabric Adhesive. Before we get into the actual review, I wanted to give you a little back story about why I bought this glue to begin with. While at Walmart one night I was shopping for supplies for my no sew pizza slice pillow. I knew I needed fabric glue and was going to buy Aleene's Fabric Fusion (which is a great glue) but I happen to notice this Super Fabric Adhesive from Aleene instead. So after reading the back of the package and going back and forth between both glues, I thought that the Super Fabric Adhesive might work better for a no sew project then the normal Fabric Fusion. I bought the glue and used it in the project. Since then, I haven't used the glue that much. Aleene's Super Fabric Adhesive (in a nutshell) is an industrial strength glue. Its made to be used on a variety of fabrics (like felt, denim, canvas, etc) and is designed to attach embellishments (like buttons, rhinestones and charms) to those fabrics. On ILoveToCreate (where they sell Aleene products) they describe the glue as ''an industrial- strength adhesive to bond fabric and hard-to-hold embellishments. It’s machine washable and dryable, and dries clear and flexible'' (source). This glue in a lot of ways reminds me of E6000 or a cousin of E6000. For example, the glue has the same tacky glue/rubber cement type feel or texture (if you were to get it on your hands). Also the glue starts coming out of the bottle like E6000 and has a distinct smell. So if you have ever used E6000, then you already have a pretty good understanding of this Super Fabric Adhesive. In terms of a glue, I do like the product. 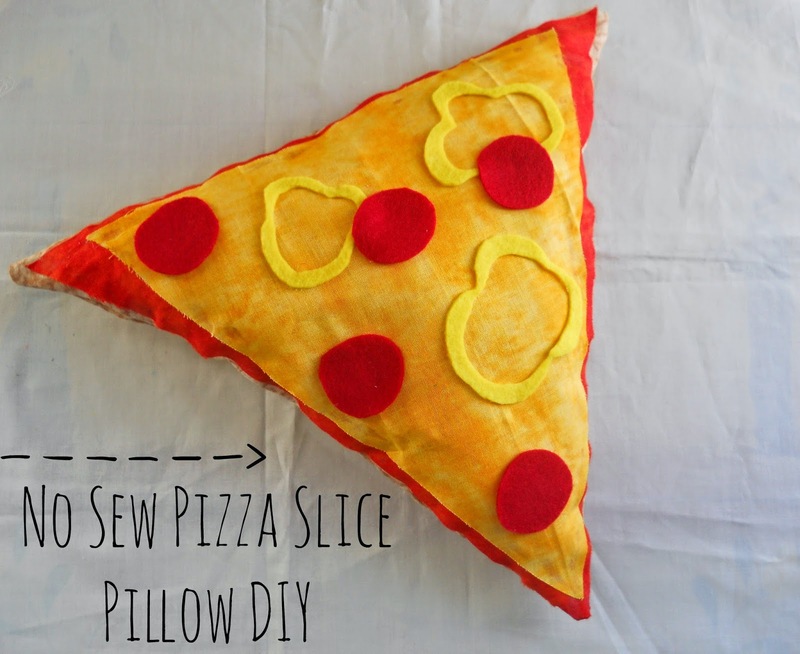 It work well on my no sew pizza slice pillow and did dry clear/flexible like the packaged stated. Personally, I feel this glue is designed more for big fabric projects then little ones. If you needed to fix your shoe or wanted to add an embellishment that was a bit bigger/heavier than your normal button (to some fabric), I think this glue would work great. So far I only used this glue on small projects and in a way its been more of a hassle. The hassle comes from the design of the bottle and the extra ''cap'' they give you. In the picture above you will see a white extension ''cap''. When you buy the glue, you get this extension cap which is supposes to help you control the glue. On the white cap you have lines where you can cut the cap to get the exact size you want. I cut the top part off so I would have a nice stead stream of glue. After cutting the cap, I put it on the glue bottle and begin squeezing the bottle. Needless to say, it did not work. The glue came out of the bottle but was so thick, that it did not want to travel down the white cap. I ended up taking the cap off and encounter a gluey mess because the glue had collected right at the opening of the bottle. Also the cap itself was a mess to clean. Honestly, I think the white cap is really unnecessary and kinda useless. I feel that the actually glue bottle tip should be pointed (like E6000) instead of rounded. That way there would be no need for the white cap. All in all, I would give this glue a 7 out of 10. As a glue its a very nice product but the packaging (in my opinion) needs some work. I really think (for this glue) is all comes down to what you are going to use it for. If your looking for a glue for small projects, I wouldn't recommend this glue. I would check out Aleene's Fabric Fusion which has always been my favorite fabric glue. It also is better to control. If you want something a little more ''super'' because your working on bigger project that might get more wear and tear, then I would check out this Super Fabric Adhesive. If you want to learn how to use Aleene's Super Fabric Adhesive and want to learn more about the glue, then check out this page by ILoveToCreate. So have any of you used Aleene's Super Fabric Adhesive? Let me know in the comments below or leave your thoughts on the blog's new facebook page.